Please enter a name, word or describe a (simple) symbol you would like burned into the wand. For symbols, you can always message me a picture so I can make sure I get the right one. Customisations might delay shipping by up to 2 days. 100% solid laurustinus (Viburnum tinus 'Variegatum') wood wand. Length: Ca 247 mm or 9 11/16"
* Every wand comes with a certificate of authenticity card included. * The wood for my wands is respectfully sourced: I only use branches I find that e.g. the wind has brought down, or that come from general garden maintenance, or similar. Because I only use solid branches and twigs for the wands, no two wands can ever be the same. * NOTE: Countries like Australia and New Zealand operate strict import restrictions on wood and other natural items. Parcels to these countries are more likely to get stuck in customs and incur additional charges payable by the customer/recipient. Very happy with this. Love the personal touch, Rabbit, that was put on it. Also the concern for Eco friendly practices. I would highly recommend you. Thank you. Use a clear oil suitable for wood, or beeswax. The wood might change in colour as it ages. This is a natural process. Bark handles with natural green details will fade in time when handled (this might not be the case with ones that have been lacquered) or if exposed to sunlight. Can I get a discount for buying more than one wand? Ask before ordering. I will add complimentary "Signed for" for UK orders when buying two or more wands, and complimentary "International Tracked & Signed" for international orders when buying three or more. 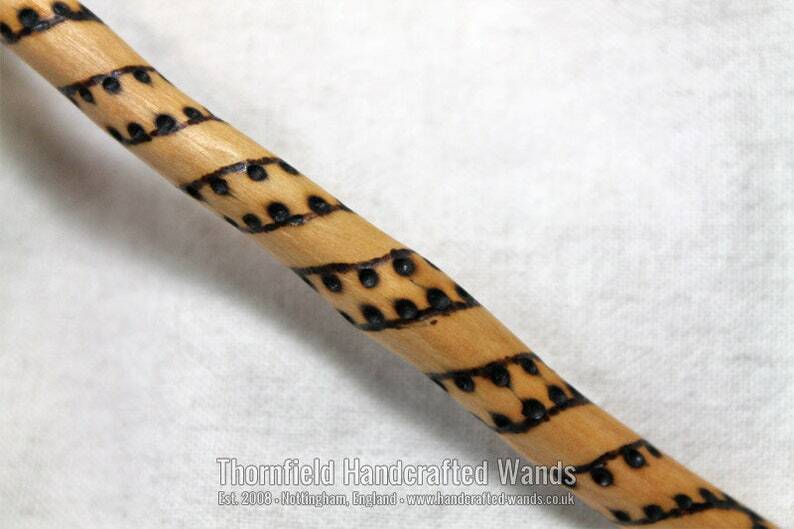 Oiled wands can be burned with e.g. a name or a symbol, and/or they can be lacquered and/or have woodstain put on them. Just let me know when ordering. Please note that customisations might delay shipping with up to two working days. I do NOT offer replicas of Pottermore or official Harry Potter wands.